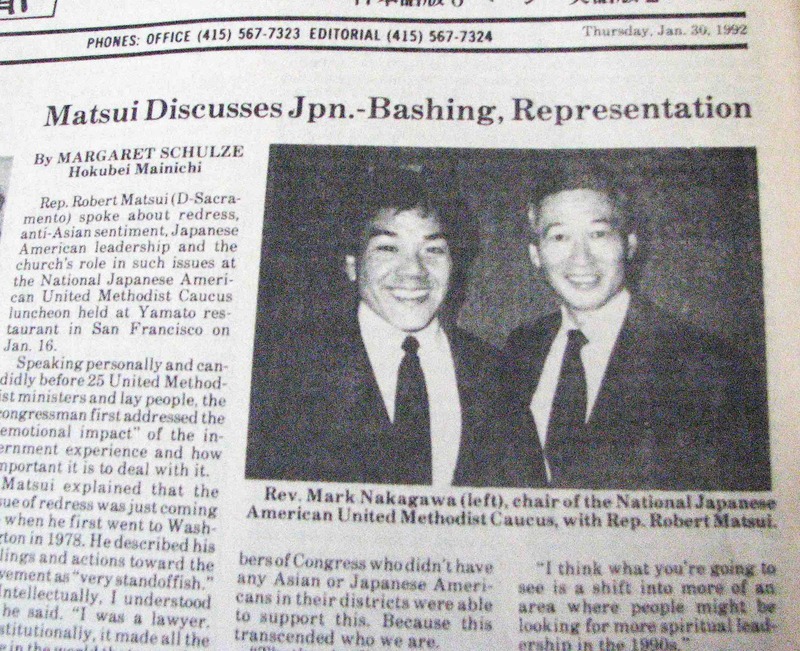 Clipping of a 1992 article in The Hokubei Mainichi featuring Rep. Robert Matsui and Rev. Mark Nakagawa. In the aftermath of the midterm elections and with the Democrats flipping the House of Representatives, they are now certain to prevent Donald Trump from sending the President Clinton-era trade agreement known as NAFTA (North American Free Trade Agreement) into oblivion (forgive me for not using the title “President” in front of “Donald Trump”). Like the biblical character Lazarus, who was presumed dead, NAFTA has been resuscitated from death back to life. It will now be tweaked to reflect the advances in trade and technology that have emerged in the 25 years since the passage of that historic trade agreement. Think about it — there was no Amazon or eBay in 1994 when NAFTA was signed into law. Gosh, how did anyone **buy** anything? A revised trade agreement among the U.S., Canada and Mexico may very well be drafted and given another name, but its core will still reflect the major elements of NAFTA. With this prophetic vision I have thus exhausted my limited knowledge about global trade. However, what I do know about NAFTA has less to do with its substance and more to do with its journey from proposed legislation into international trade law. That happened through the tireless work and efforts of a Sansei congressman who served as Clinton’s point-person and messenger in chief to get it through Congress: the late Rep. Robert T. Matsui, who served 14 consecutive terms representing the 5th Congressional District in Sacramento until his untimely passing on Jan. 1, 2005. I was privileged to be the congressman’s pastor during my first ministerial appointment to the Sacramento Japanese United Methodist Church, from 1985-1994. It was already an exciting time for the JA church and community, with all four of our congressional and Senate leaders heavily engaged in the mission of passing redress legislation that culminated in the Civil Liberties Act of 1988; the late Senator Spark Matsunaga of Hawaii, Congressman Norman Y. Mineta of San Jose, the late Senator Daniel K. Inouye of Hawaii, and Congressman Matsui. But beyond that achievement, to have one of our very own selected by the president to shepherd major trade legislation of his presidency was a nod to the abilities of our JA congressional representatives of that era. businessman H. Ross Perot, who claimed that NAFTA would result in a mass exodus of U.S. jobs heading to Mexico so fast that it would produce a “huge sucking sound” that we would hear. I arrived at my destination before I could listen to the entire speech, and I sat through the meeting barely focused on it. The next morning, I called the Commonwealth Club to find out if I could obtain a recording of it (on a land-line phone, of course). Fortunately a cassette tape was available, and I received a copy later in the week. Listening to it over the years brings back fond memories of that era. It was a time when our Nisei and older Sansei political leaders took the risks of running for public office on all levels, and succeeded in proving themselves as capable leaders in mainstream society. Like John the Baptist paving the way for Jesus, they have made the roads smoother and straighter for younger JAs coming after them who seek to be in leadership positions today (the same is equally true of our Nisei clergy, but that’s another story).